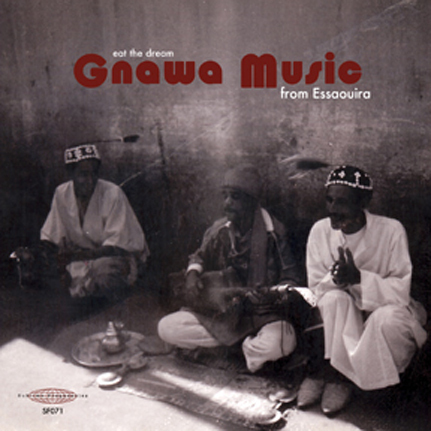 Recorded and compiled by Tucker Martine in 1994, the bulk of this album features the magnificent results of a chance meeting between Martine and the late, great master of Gnawa music, Maâllem Boubker Ghania (1927–2000), who kindly offered to organize a several-day informal recording session in his home. Martine began rolling tape as musicians came and went throughout the sessions. These spectacular recordings from Essaouira Morocco are interwoven here with other encounters including a wedding procession in the streets of Marrakech, snake charmers of the Jemma El Fna with their rhaitas, calls to prayer with children playing while James Brown echoed off of the labyrinthian walls, Moroccan radio dial surfing and more. The Gnawa are a mystical brotherhood whose ancestors migrated from West Africa to North Africa approximately 500 years ago. After integrating into the local Berber and Arabic societies, a unique cultural blend resulted which is reflected in their music. Their complex liturgy borrows both from the traditions of mystical Islam and African Shamanism. The Gnawa's trance-inducing music accompanies rituals such as the healing of psychic disorders and scorpion stings, Ramadan celebrations and animal sacrifice. Participants in these all night rituals are invited into an ecstatic state. The primary instruments of this tradition are the krakebs (a pair of metal clappers) and the guimbri (or sintir), a three stringed lute with a camel skin covering and a body carved from a log. The one short string and two long strings are made of goat gut. Limited Edition LP housed in a heavy-duty tip-on jacket with insert containing additional photos of the musicians and Tucker Martine’s liner notes.